In 1999, Jeph Jerman left Seattle for the warmer climes of Arizona. A couple of years later, Paul Hoskin relocated to the distant shores of the Olympic Peninsula. After a five-year break from playing together, these two important members of the Seattle improvised music community reunite this June to barnstorm the Northwest. As a duo, these two are capable of “burning” free jazz torrents, or delicate explorations of “nature in her manner of operation”. It is not about the gratuitous display of chops, but listening to the absolute speed of sound: form implicit within a context of no-form, dynamics as much as melody, dense to sparse, thick to thin, from the knowable to the mysterious, quiet sounds of no discernible place or idiom. Jeph Jerman (percussion, natural objects) has been known as a “free jazz” drummer (Blowhole), spent time manipulating recorded sounds (Hands To), and evolved into a virtuoso listener and activator of tiny sounds made by the gentle manipulation of unamplified natural objects (solo and with Animist Orchestra). His playing is characterized by a heightened attentiveness to his materials and a remarkable presence in the moment – or is it absence? 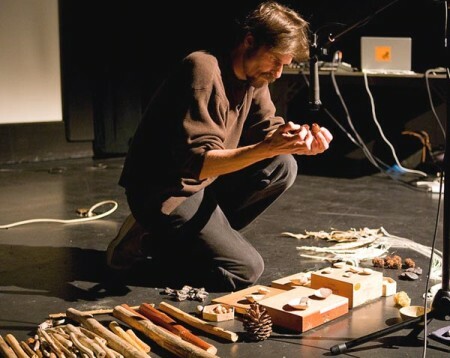 Watching Jerman interact with his array of rocks, sticks, feathers, seed pods, shells, etc., one gets the impression he is not so much “playing” them as he is listening and serving as a medium for their own songs.